Last night gave us a great fight between two of the better fighters in the NHL today, as Brian McGrattan and Patrick Bordeleau went toe to toe in this fantastic bout in the fight period. The scrap started in the Calgary offensive zone and moved to center ice before it was over. The video is below and courtesy of our friends at http://www.hockeyfights.com. The Philadelphia Flyers have had a very frustrating season, and that is no secret to anyone who actively follows the NHL. Going into last nights game the Flyers had a 3-8-0 record and they then proceeded to get routed 7-0 and that is fine, every team has a stinker in them, in fact Florida has one every other game it seems. Regardless the Flyers took their season to a new low last night in what can only be described as thug-like. It started after the Capitals went up 7-0 on Joel Ward’s hat trick goal which was the first in Ward’s career. The following face-off Wayne Simmonds went out and laid a hard clean check on Steve Olesky and then he went and gave Tom Wilson a hard but again clean check, all of this is fine and it even led to a fight. The part that really baffles me is the fact that Ray Emery went skating down the ice and proceeded to start a fight with Braden Holtby and Holtby clearly wanted no part of the scrap but Emery proceeded to fight him anyway and pounded him with several big punches. And while that fight ended the really pathetic stuff took place, two more fights broke out and that lead to Vincent Lecavalier getting injured in his scrap with the aforementioned Steve Oleksky. In all the Flyers had 99 penalty minutes on the night with 64 of those coming from the semi-brawl. Tack that onto the 17 penalty minutes Steve Downie got for starting a fight in the second period and that comes out to 81 penalty minutes just for fighting for the Flyers. Even more than that is that the Flyers might need a new back up goalie if the NHL wants to look at Ray Emery’s actions which were out of line and had no business of even happening. If you really look at the situation, Ray Emery’s actions led to Vincent Lecavalier’s injury, because without Emery’s fight, the third and fourth fights probably do not even happen. And earlier in the game before all of this broke out the Flyers fans were chanting “Fire Holmgren” throughout the game, which is a call to fire GM Paul Holmgren. The Flyers are in shambles, and unless they start playing better, this type of thing is likely to keep happening. The Flyers historically are known to be a physical team. And I doubt Ray Emery will change his ways even with a suspension that is likely coming. 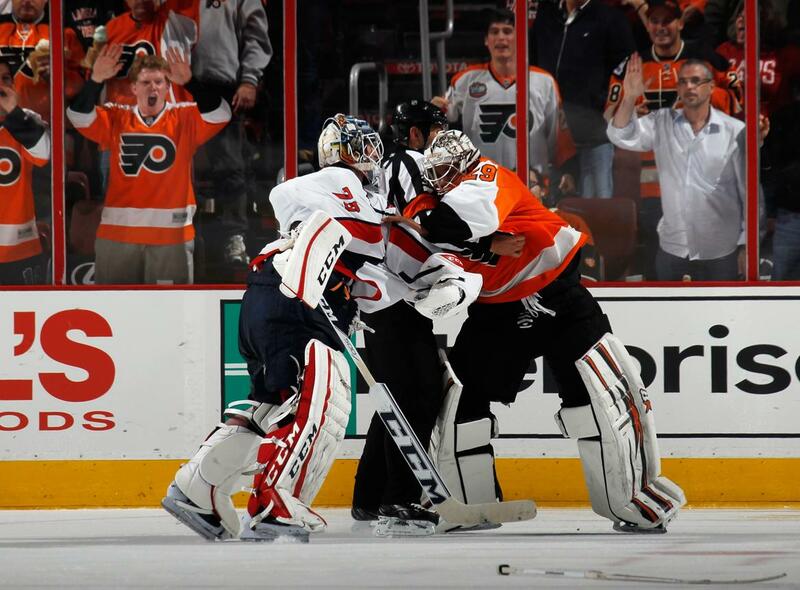 The Capitals and Flyers meet again in December in a home and home on the 15th and 17th. During last nights Providence @ Wilkes-Barre Scranton Penguins game things got really ugly, and admittedly at was all started by the Providence Bruins. Everything took place in the third period at the 11:44 mark when Penguins goalie Brad Thiessen covered the puck and Graham Mink made his way over and jumped him for what it seemingly no reason but to be a scumbag. Several altercations broke out and Mink was given a Match Penalty for intent to injure and will probably miss a lot of time with a suspension. Thiessen stayed in the game and posted a 30 save shutout. There was also a second altercation on a 5 on 3 Wilkes-Barre goal. What happened was the Penguins scored and Niklas Svedberg of the Bruins slashed Paul Thompson in the back of the leg lightly near where Thompson’s calf area and after that happened a scrum ensued. So instead of trying to explain any longer, I’ll let the video tell the story. If you are looking for the fights they start at roughly the 6:45 marker.